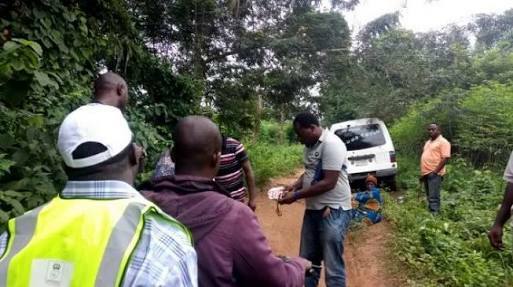 This was an election where INEC has a polling unit inside a FOREST and no police or security was available to provide security on the road. As seen in the photo above, APC thugs packed their bus on the road to the Forest and were screening people before they could pass. If you don't have White Handkerchief, a sign that you will vote for APC, you will be intimated and beaten till you run away. How is this an election in Nigeria of 2018? Delegations from the Missions of the European Union, the United Kingdom and the United States have opened up that they observed widespread interference and intimidation of voters, journalists, and civil society observers by political party supporters and security agencies during Osun governorship rerun. The observers noted that their findings mirrored those of leading civil society groups who also observed Thursday’s supplementary election, and noted that the situation contrasted with the findings of Saturday, September 22, when the election first took place. In a joint statement on Saturday, the US and others stressed that the neutrality of the security services and responsible conduct by party agents, both inside and outside polling units, would be essential to free, fair, credible and peaceful elections in 2019.